Jamie of The Baby Guy NYC showcases the Ecleve baby carrier at JPMA in Washington D.C. 2018. 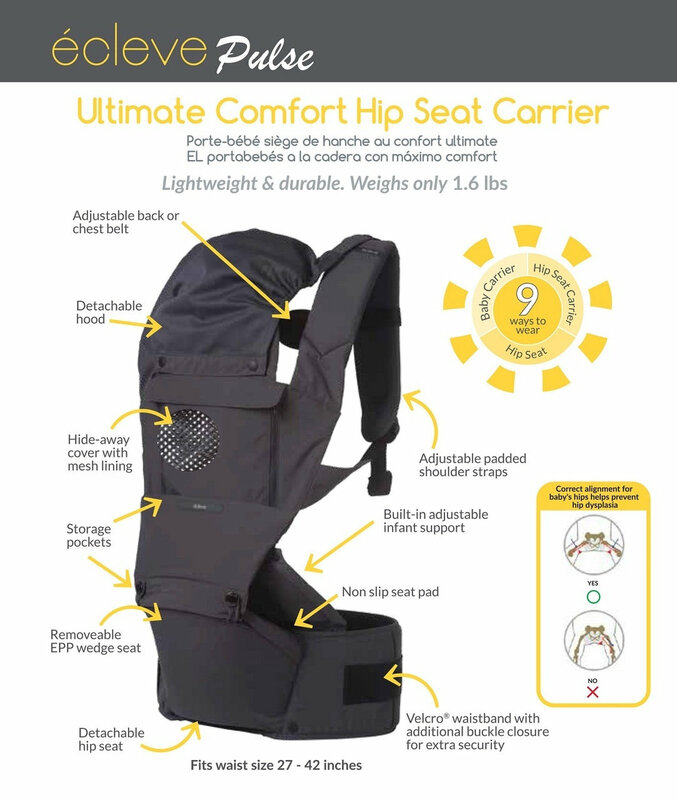 The Ecleve Pulse Ultimate Comfort Hip Seat Carrier allows you to comfortably carry your child close to you from infancy to toddler years, thanks to our innovative hip wedge support seat. 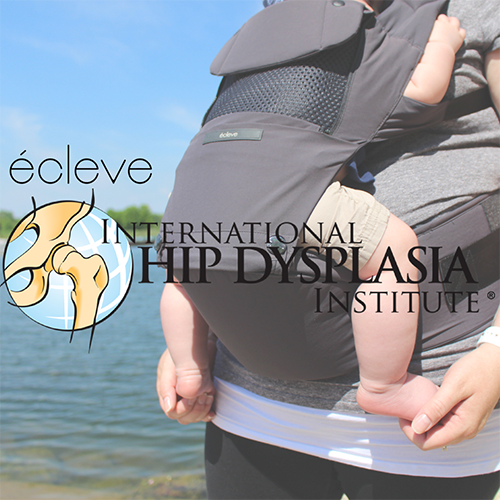 Unlike other outward facing and back carriers, Ecleve Pulse features a detachable hip seat which distributes baby’s weight evenly, thus easing back and shoulder pressure for the parent. With 9 different ways to wear, this versatile baby carrier is ergonomically designed to grow with your child, making it the only carrier you’ll ever need. Comfortable in any season, the Ecleve Pulse Carrier features a wrap away panel with breathable 3D air mesh lining, for added comfort, great for the warmer summer months. 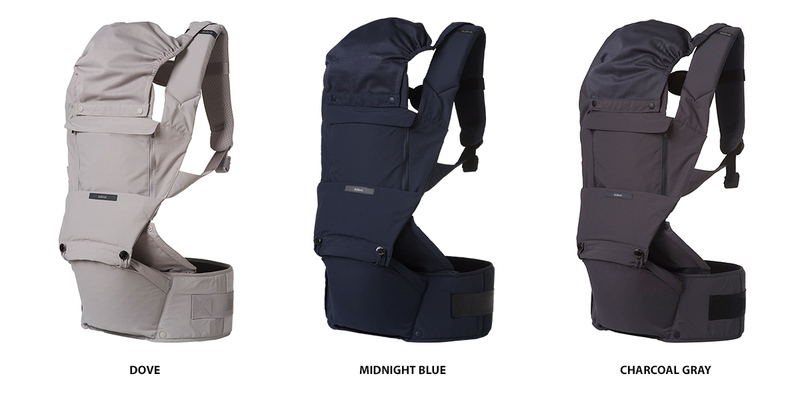 Whether you're on a short walk or a trip to the grocery store, the Ecleve baby carrier has you covered. Weighing only 1.6 lbs and made from 100% Supplex Nylon, a soft and breathable fabric that is durable, water repellent, and dries quickly. PROPER ERGONOMIC POSITION FOR BABY : Custom ergonomic design supports your child and maintains a healthy seated position, reducing the risk of hip dysplasia. SUPERIOR COMFORT : Extra thick mesh padded shoulder straps provide breathability and comfort for mom and dad. 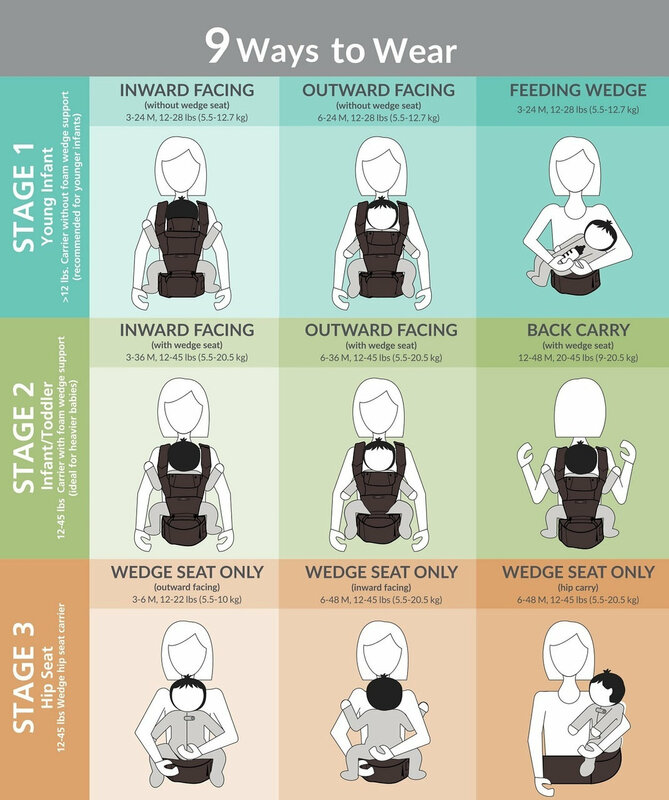 9 WEARING OPTIONS : Allows you to find the most comfortable carry positions as your baby grows. DETACHABLE HIP SEAT : Hipseat can be used separately as an infant feeding or nursing support wedge, or as extra support for heavier toddlers. When positioned correctly around the parent’s waist, it evenly distributes baby’s weight and prevents leaning or twisting. ERGONOMIC FOR EVEN WEIGHT DISTRIBUTION : Wedge seat distributes baby’s weight, provides lumbar support, and relieves back and shoulder strain for the parent. "hip-healthy" product when used as directed." Superior comfort : Extra thick mesh padded shoulder straps provide breathability and comfort for the parent. Detachable Hip Seat : Hip seat can be used separately as an infant feeding support or as extra support for heavier toddlers. When positioned correctly around the parent’s waist, it evenly distributes baby’s weight and prevents leaning or twisting. Ergonomic for even weight distribution : Wedge seat distributes baby’s weight and relieves back and shoulder strain for the parent. Additional safety features : Velcro waistband closure with additional buckle closure for extra security. Great for all-season use : Fold-away front panel rolls down into a self storage pouch to reveal a breathable mesh panel, making it great for the warmer summer months. Made with rugged and durable materials : Supplex(r) Nylon is water repellant, quick drying, and resistant to shrinkage and tears. Detachable Privacy Hood : Provides extra privacy and protection from harmful UV rays. Storage Pockets : Ideal for storing small items such as a cellphone or an extra diaper and wipes. Removable EPP Foam Wedge : Foam wedge seat can be removed to allow for extra storage or for washing. Super lightweight : Feather-light weighing only 1.6 lbs. Outward Facing (without wedge seat) 6-24 mo, 12-28 lbs. Feeding Wedge (with the addition of the foam wedge support) 3-24 mo, 12-28 lbs. Inward Facing with Wedge Seat 3-36 mo, 12-45 lbs. Outward Facing with Wedge Seat 6-36 mo, 12-45 lbs. Back Carry 12-48 mo, 20-45 lbs. Wedge Seat Outward facing 6-48 mo, 12-45 lbs. Wedge Seat Inward facing 6-48 mo, 12-45 lbs. Wedge Seat Hip Carry 6-48 mos, 12-45 lbs. For babies 3-48 months, 12-45 lbs. Wash hip seat and carrier separately. Remove the foam wedge from the hip seat before washing. Before washing, secure all buckles in the clipped position. Use mild detergent, gentle cycle. The detachable hip seat makes my little ones feel as if they're floating a little as I shift them to my back. They're able to sit up higher and see over my shoulder as well. The wedge comes out easily, though, for those smaller kiddos. Since my youngest is right on the cusp of weight classes, I've taken to leaving the wedge in place so that the older kiddos can share. While I generally prefer to back carry my kiddos as soon as they're able, the Écleve Pulse offers 9! options for little ones weighing 12-45 pounds. The waistband is thicker, providing support in any carry position. It fastens using hook & loop with an added buckle closure for safety. The front panel unzips down to let the breathable mesh panel keep you cool in warm temps. Click the button below to add the ÉCLEVE Pulse Ultimate Comfort Hip Seat Carrier to your wish list.